Back row: Coach Dale Williams, Manager. 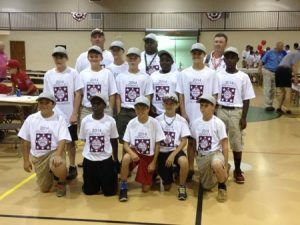 James “Fish” Herrin, Coach John Brown, Jr.
On Friday, July 11, the Edgefield County team, District 3 Ozone Champions, suffered a disappointing loss 5-6 against District 4 Midland in game one of the Dixie Youth Ozone Tournament in Hartsville. In game two on Sunday, July 13, the local team was down 0-3 when Michael Feagin was brought in to pitch and he allowed no more runs to District 5 winner Bishopville. The team rallied to a 8-3 win. Game three, Monday night July 14 was against District 10 winner Greenwood and the Edgefield County Team won 2-0 with Dalton Williams pitching all 6 innings and a homerun by Hunter Corley . Family and friends in Hartsville report that this has been a “team effort” with all members of the team providing the offense and defense needed for the wins. The team played again Tuesday night in the double elimination tournament which began with 12 teams but this was to be their final game as they lost 4 -6 to Lexington. The home team was winning 3-1 but Lexington scored 5 runs in the bottom of the 5th. It was a good run for the District 3 Ozone Champions from Edgefield County and the county is proud of them. The Edgefield County O Zone Allstar Team won the 2014 King Dixon Sportsmanship Award at the Dixie Youth State Tournament.